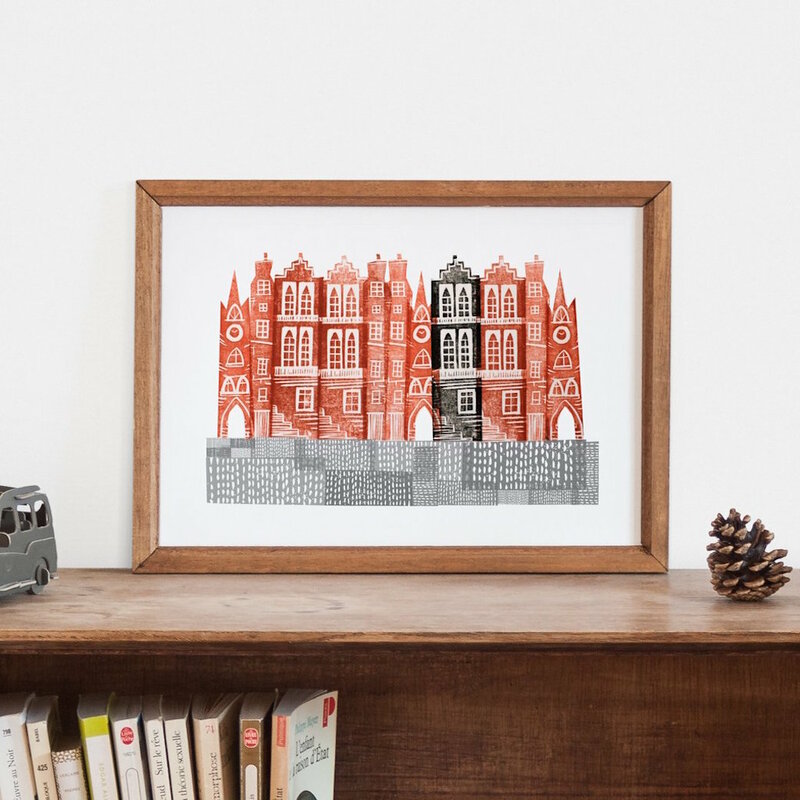 I was recently introduced to the work of printmaker and pattern designer Jenni Douglas and, unsurprisingly, given that I’ve lived in or near Edinburgh for most of my life, I was immediately drawn to her collection of Edinburgh prints and linocuts. Jenni launched her business, Jenni Douglas Designs, in 2012, and her collections have expanded to incorporate animals and birds – I love her Woodpigeon Pair Print with its mustard, teal and grey combo – and woodland themes. 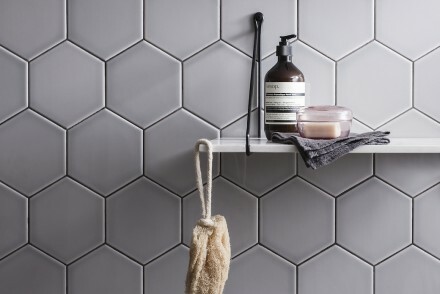 There’s also an extensive abstract pattern collection that includes shapes and forms inspired by nature – the Hillwalks Block Print is beautifully bold and graphic – along with midcentury references. 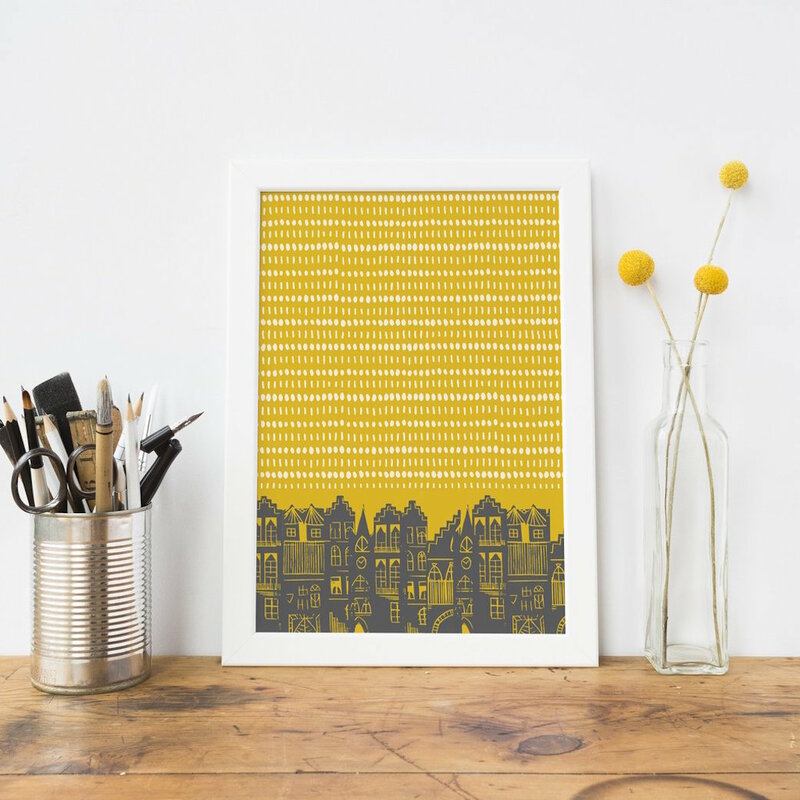 As well as prints, Jenni also features her prints on a range of homewares including cushions and lampshades. Which brings me back to the Edinburgh collection. 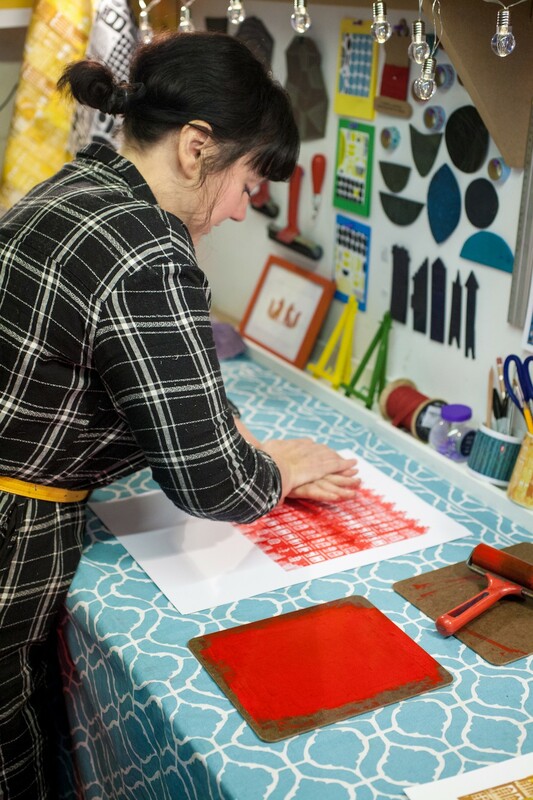 Jenni is also based in the city, working from her studio in Leith – the photos of Jenni printing in her studio were taken recently by Stewart Bremner. I was intrigued to hear her story, so I caught up with Jenni to ask about the inspiration behind her work. What inspired your collection on Edinburgh’s Old Town? 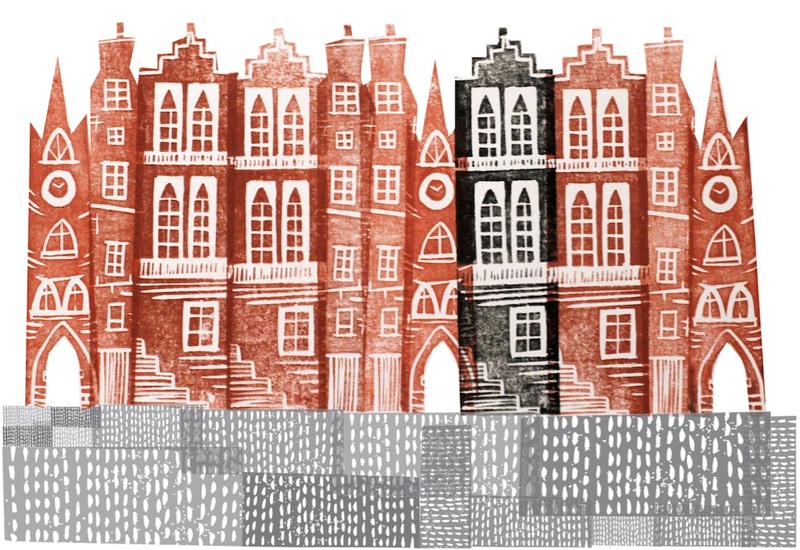 I grew up right in the middle of the city’s Old Town, which some people might associate with Festival hustle and bustle, but for me it’s always felt like a very special and peaceful space in the city to explore, switch off and let my imagination play. When I was putting together my first collection, it was the only imagery I really wanted to explore – maybe subconsciously as a tribute to my childhood. 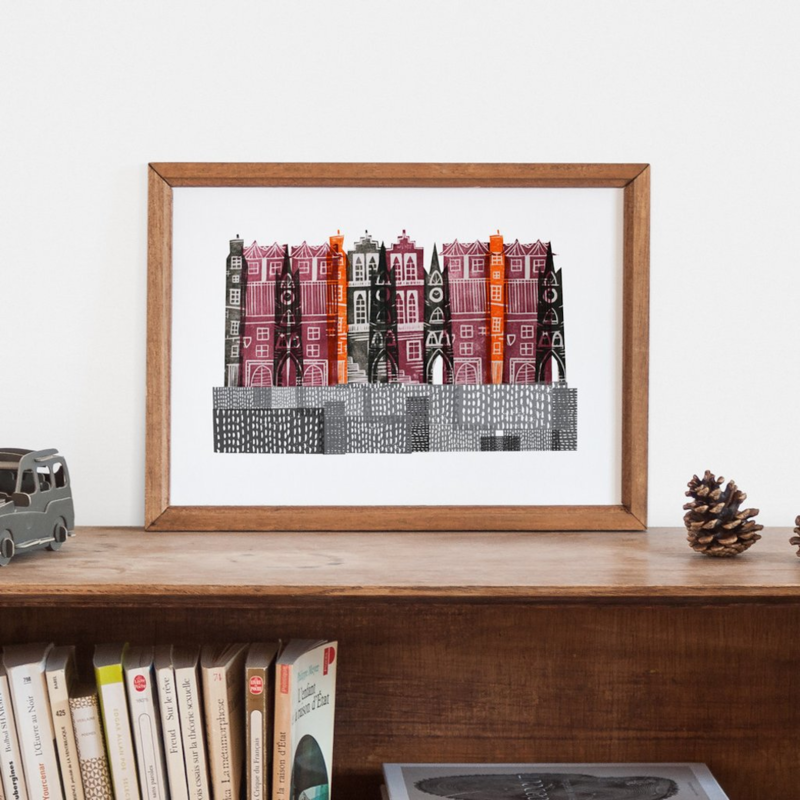 With so much iconic architecture in the Old Town, how did you choose what to feature? 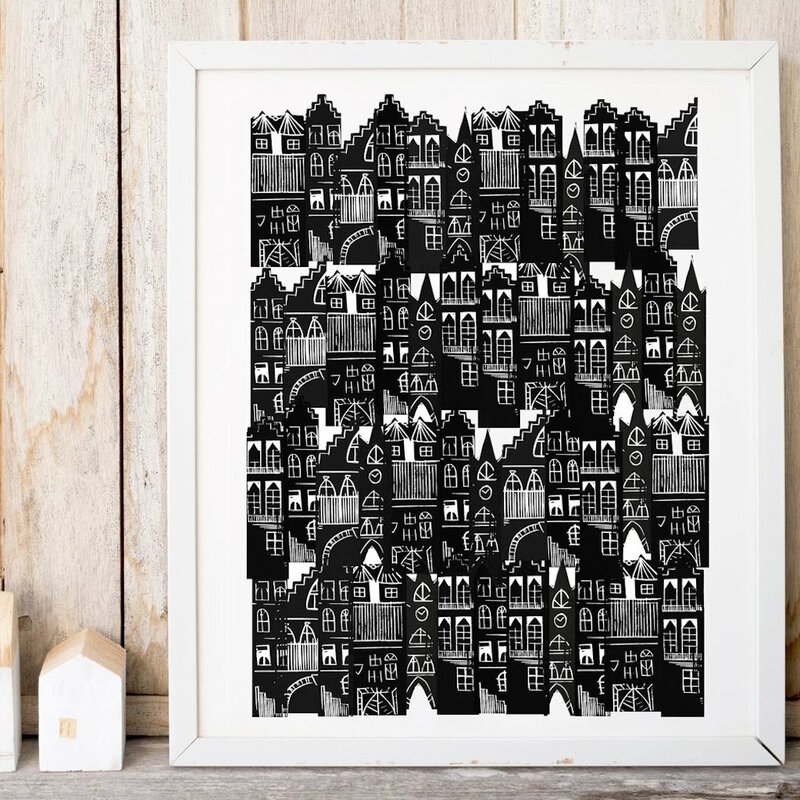 What interests and inspires me the most about the Old Town of Edinburgh is the atmosphere and the sense of how much it means to people – not just locals like me but people from all over the world who visit and fall in love with the place. In choosing what to feature, it was more important to me to try and capture that charm and character of the place as a thing to connect to, rather than basing designs on specific buildings or streets. I try to make time for drawing in some shape or form every day, whether it be a sketch of something or experimenting with different types of mark making. I use photography a lot too, to capture interesting textures or patterns I see when I’m out and about. I used to do a lot of manual/film photography before I started my business and had more time, and these days it tends to be quick snaps with my phone, which makes me cringe slightly, but it’s a very useful tool and can still be fun. When I start work on a new pattern or print idea, I’ll refer back through my library of photos, sketches and marks and wait for something to jump out at me. 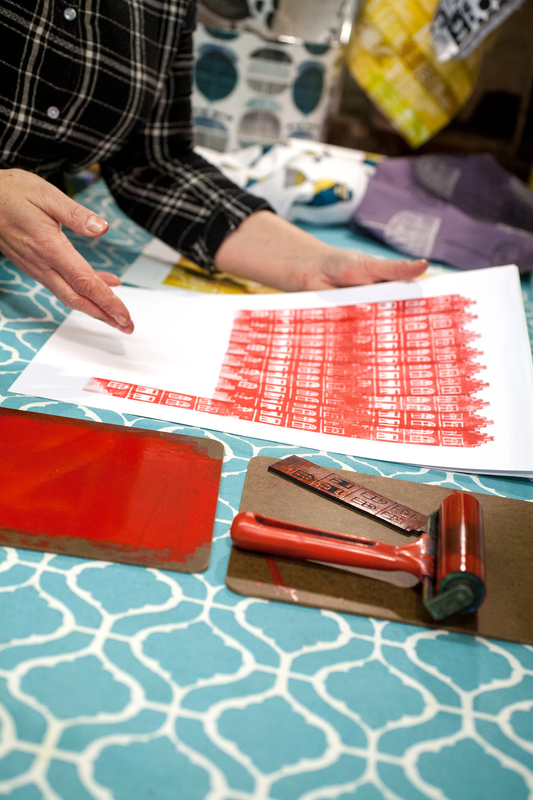 I almost always use lino as a way to transfer my ideas onto paper or fabric, usually as a series of individual blocks which I press by hand and arrange by eye. It’s a process that works well for me and I absolutely adore it, even when designs turn out completely differently to how I imagined! How do you decide on the colour palette? I almost always work from a fairly compact palette of strong, vibrant colours such as yellow ochres, teal and cadmium red which I team up with grey or black accents. The colours have been favourites of mine for a long time (give me a red skirt and a mustard yellow jumper and I’m a happy woman), but I’m sure they refer back to prints and patterns from the 1950s. How long does a collection like this take to put together? 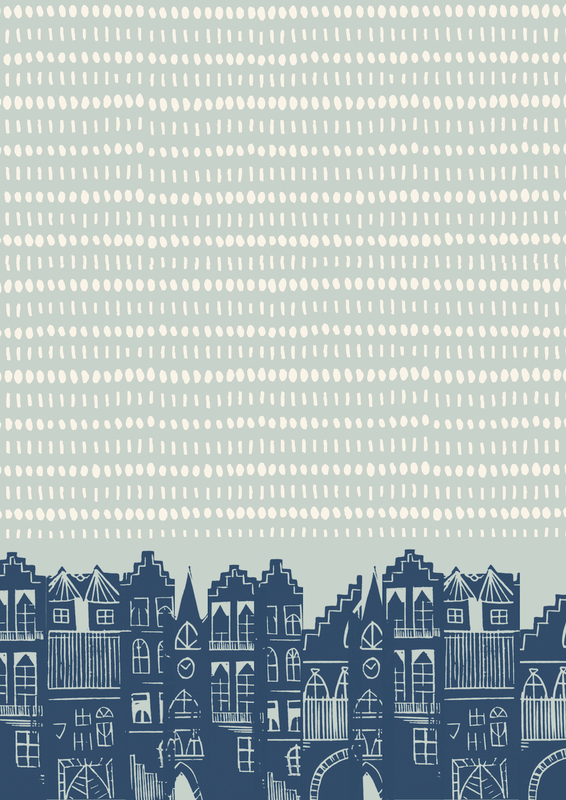 Once I’ve got to the point of knowing which design elements I’m going to use, things tend to move along quite quickly. 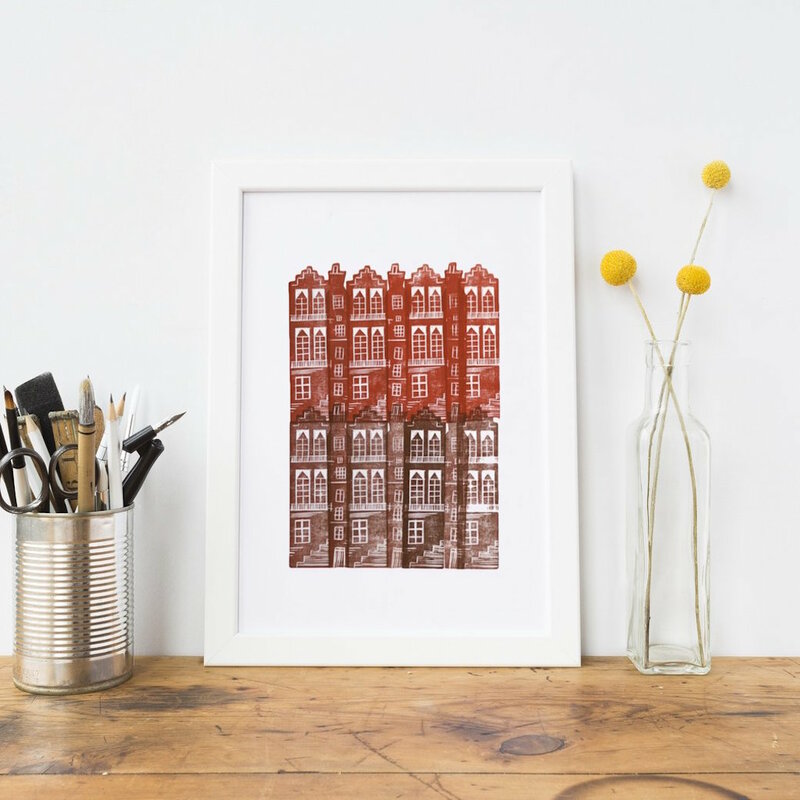 For the Edinburgh collection, I decided to design a set of five buildings (I like odd numbers) which then took a few days to carve into lino and test print to make sure I was happy with how they looked next to each other and layered up. 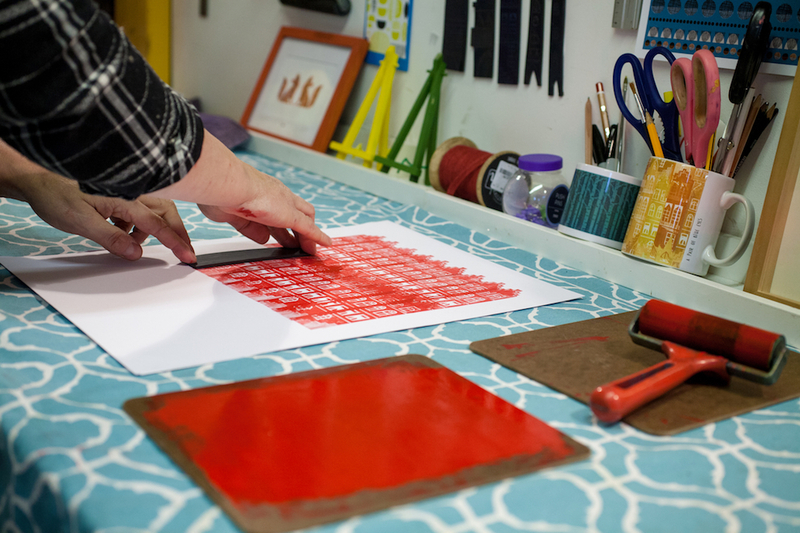 Each colourway in the series took a day to hand press – that was the most time consuming part, but also the most fun. Tell us a little about your working day – what does a day in the studio look like? 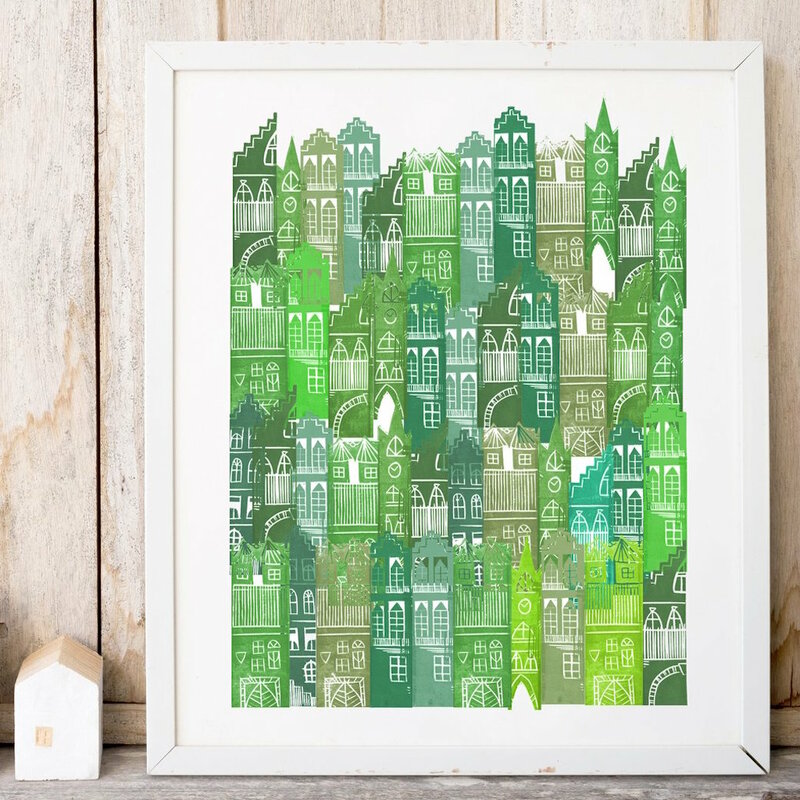 I work from a lovely little studio in Leith, just a couple of miles from where I live. My workshop is housed in what used to be an old factory and the building is full of character, from big fireplaces to rather scary looking ovens! I like to get in nice and early in the morning – I’m often photographing products for my website, so I try to catch the best light first thing for that. Each day is different and on most days my work tends to stretch into the evening, so I try to break up my time with walks, a trip to the gym or coffee with a friend. Working in a studio can be quite isolating, so making time for people and other things is really important. 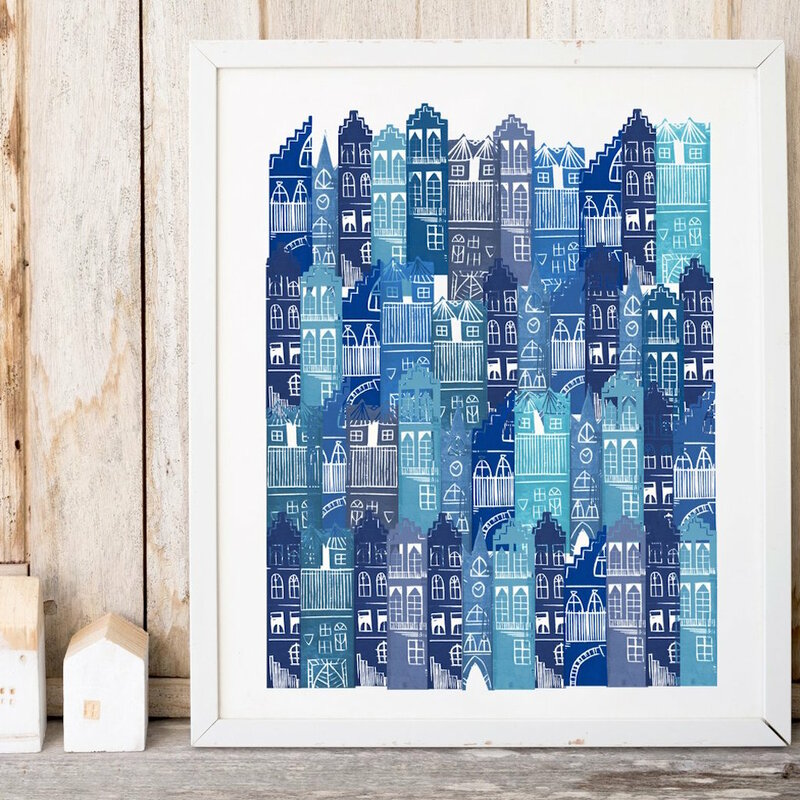 I’m very lucky to work amongst a vibrant community of artists and makers in Edinburgh, many of whom are friends of mine, and who constantly inspire me with their hard work and dedication to their art, as well as supporting and challenging me to keep going. One particular artist who stands out it Megan Chapman, an abstract expressionist painter from the US who has now settled in Edinburgh with her Scottish husband. Her work breathes life into me, especially on cold, dark Edinburgh days. 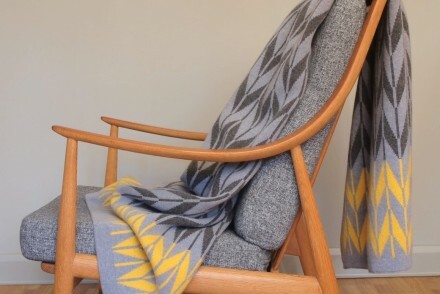 Back when I was a teenager in the 1980s, I fell in love with the colours and patterns of midcentury print and textile design by artists such as Marian Mahler and Marianne Westman. 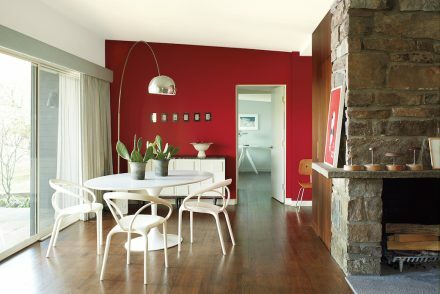 Of course, the Midcentury Modern style has become very popular again, but it really was the first period of art and design I really connected with and it has lived inside me ever since. I also found it very exciting and inspiring that there were so many female pioneers – painters, printmakers, photographers and designers – involved in the industry at the time. Lastly but definitely not least, I am massively inspired by the imagination and creativity of my late uncle, filmmaker Bill Douglas. His eye for composition, bravery in storytelling and his special way of communicating the subtleties of life through image are things which I am in awe of and continue to be inspired by every day. In the short term, I’m gearing up for a busy winter season of markets and events, which means long days of making products and packaging (I make all my own packaging from recycled studio waste). The next major goal I’d like to achieve is to open a shop and workshop space where I can make, sell, teach and help promote other local artists and makers. With thanks to Jenni Douglas. You can see more of Jenni’s work here, and follow Jenni on Twitter, Pinterest and Instagram. All photos of prints from Jenni. All photos of Jenni in her studio by Stewart Bremner.